One of Baltimore's quirkiest destinations is the American Visionary Art Museum (AVAM) located in the Federal Hill neighborhood south of the Inner Harbor. AVAM is home to art made by self-taught artists, which means that the museum celebrates the inherent creativity and artistic ability that is found in all of us. 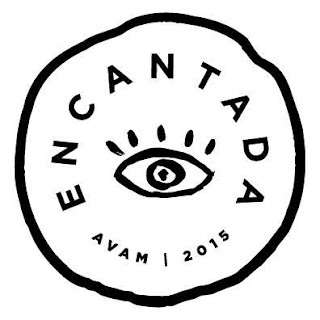 While the museum holds an incredible and inspiring collection of art in many different mediums, AVAM creates art of its own through Encantada, the in-house restaurant that serves up beautiful and consciously sourced fare that reflects the best of local Mid-Atlantic cuisine. Just over a year old, Encantada has always held a place on my Baltimore restaurant wish list, but the opportunity never presented itself until I saw that they would be participating in Baltimore Restaurant Week (BRW), in which tons of restaurants in town offer a prix fixe menu for one flat price. To celebrate finishing my summer semester classes, I decided to treat myself to a night out on the town. I planned to go for dinner because the preset BRW menu had the most options that were safe for me. However, the regular menu is remarkably special diet friendly, as options are marked as vegan, gluten-free, vegetarian, or pescetarian accordingly. 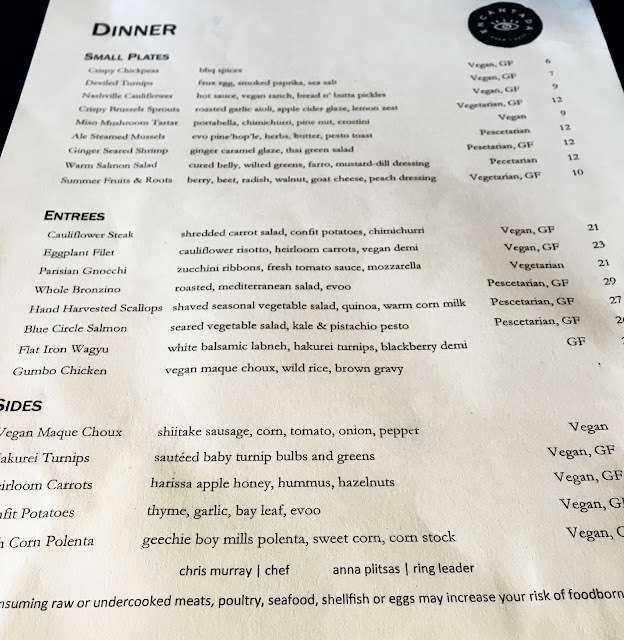 While there are meat options on the menu, the spotlight really goes to the vegetable based options, which Encantada sets out to prove are anything but boring. Because I went during BRW, I had a smaller selection of items to choose from on a three course prix fixe menu for $35. The three courses covered were small plates, entrees, and dessert. 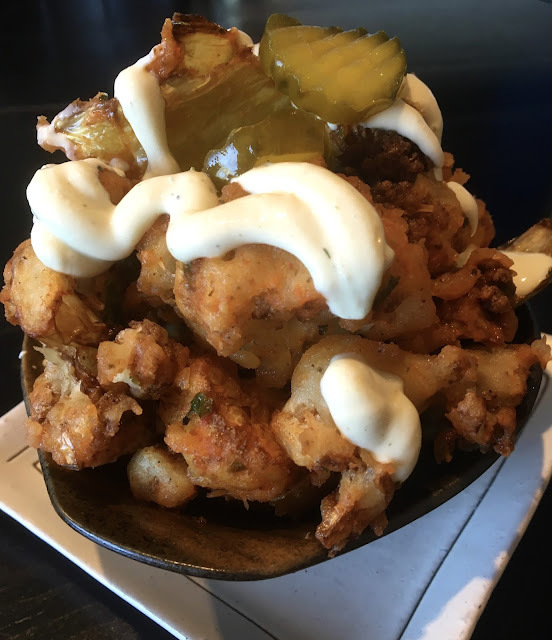 For my small plate, I chose the Nashville cauliflower, which was an unexpected hit out of the park for me. The bas were large spicy cauliflower florets that were crunchy on the outside, tender on the inside. Adding a dash of cool creaminess, vegan ranch dressing was drizzled on top, and sweet bread and butter pickles turned this seriously amazing dish into a real showstopper. Continuing on the cauliflower theme, I selected the vegan cauliflower steak as my main entree. 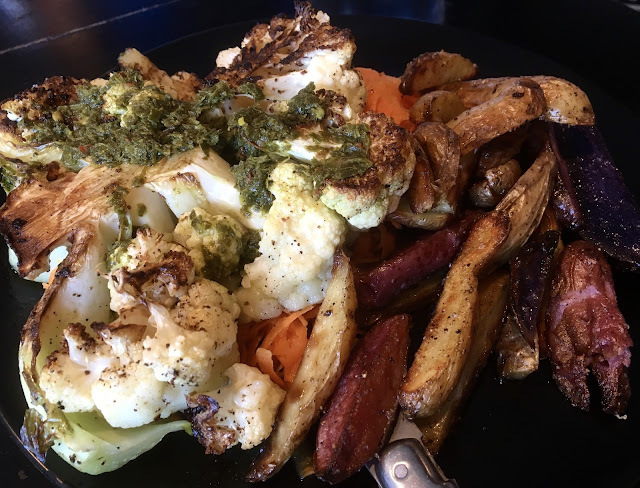 Atop the grilled cauliflower was a potent chimichurri that added a nice flavor from the medley of herbs used. Accompanying the "steak" was perfectly salted roasted colorful potatoes and a carrot and pickled red cabbage salad that added a nice vinegary taste that added contrast. While not as daring as my starter, the dish had undeniably fresh and fun flavors and ample portion sizing. By this point in the meal, I was stuffed almost to capacity, but I couldn't back down from dessert: raw chocolate cake. The cake itself was beautiful, topped with powdered sugar and positioned in the center of a liquid chocolate lake. Every bite packed decadence and indulgence, without sugary sweetness. The cake smartly let the chocolate shine, and notes of nuttiness added nuance without turning this into a sugary, over-the-top, and forgettable dessert. Overall, my meal was memorable and truly special. 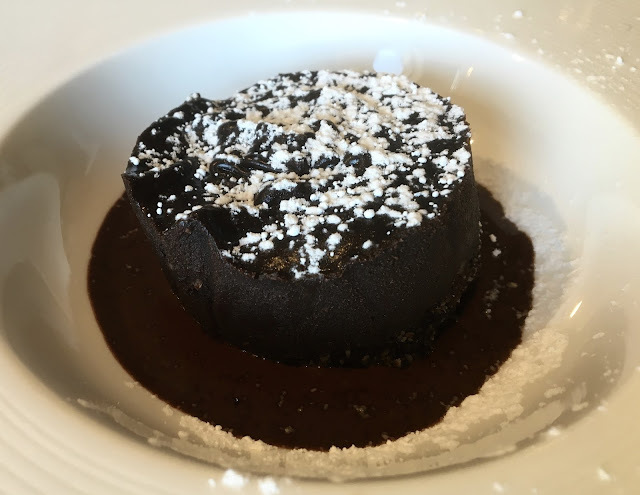 While not an everyday restaurant, Encantada is a wonderful splurge for both the experience and the food, and I recommend tagging on another hour or two to explore the museum while you are there (it closes at 6pm). You'll leave feeling inspired, which is a true rarity when dining out. With many safe options, and a consciousness of special diets, this restaurant is sure to please everyone in your party. My advice- definitely take note of BRW deals (there's one in the summer and winter). Getting the three courses for one flat rate allows one to truly explore the menu and get a feel for the creativity and variety present on Encantada's menu. Special Features: Make reservations online through Open Table right here.